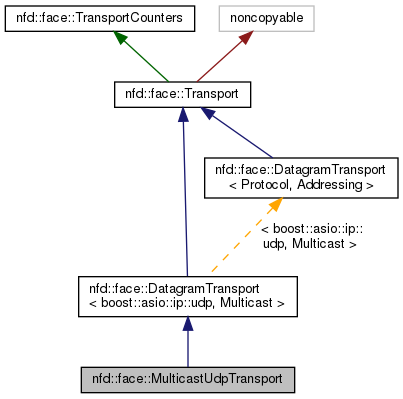 A Transport that communicates on a UDP multicast group. Definition at line 49 of file multicast-udp-transport.hpp. Creates a UDP-based transport for multicast communication. Definition at line 45 of file multicast-udp-transport.cpp. References nfd::udp::computeMtu(), ndn::nfd::FACE_PERSISTENCY_PERMANENT, ndn::nfd::FACE_SCOPE_NON_LOCAL, NFD_LOG_FACE_INFO, NFD_LOG_FACE_WARN, nfd::face::QUEUE_ERROR, nfd::face::Transport::setLinkType(), nfd::face::Transport::setLocalUri(), nfd::face::Transport::setMtu(), nfd::face::Transport::setPersistency(), nfd::face::Transport::setRemoteUri(), nfd::face::Transport::setScope(), and nfd::face::Transport::setSendQueueCapacity(). Definition at line 75 of file multicast-udp-transport.cpp. References nfd::face::getTxQueueLength(), NFD_LOG_FACE_WARN, and nfd::face::QUEUE_ERROR. Definition at line 135 of file multicast-udp-transport.cpp. Definition at line 170 of file multicast-udp-transport.cpp.